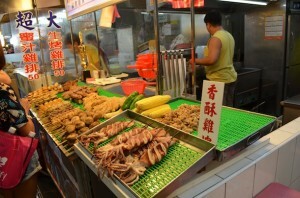 Ask someone what the best part of Taiwan is, and very likely you will hear the answer “food” or “night markets”. As the sun sets to rest, many Taiwanese are ready to start another busy night. Anyone who has ever visited will tell you that night markets in Taiwan are a must if you want to experience the country. Hear and feel the bustle of the markets as stall owners shout their menus or wares, hungry diners placing their orders, curious shoppers making their bargains, the excitement of visitors playing mini games for shots at prizes and the heavenly smell of authentic Taiwanese food everywhere that can get anyone’s mouth watering. 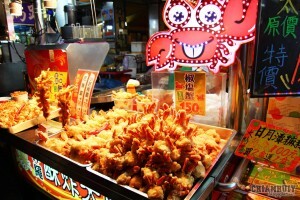 Night markets are the heart and energy of Taiwan, especially the food. Growing up with a Taiwanese mother, I listen to her reminisce about “stinky tofu” and “oyster omelettes”. Living in New York City, with places like downtown Chinatown and Flushing just a train or bus ride away, I have been able to get a taste of some of the popular Taiwan street food, however there is no way I will ever get to try them all nor at the price it would be in Taiwan. Street food at night markets in Taiwan run around $ 1 USD per serving, and with stalls upon stalls of food of all varieties, $5-10 USD will having you eating like a king or queen. Due to certain circumstances, I may never be able to visit Taiwan but I always dream of visiting the night markets. Nearly four years ago , I have found an organization that holds an annual event that makes up for my inability to visit my mother’s home country. Taiwanese American Professionals, aka TAP holds a street fair in Williamsburg each to replicate the night market experience with karaoke, photo booths, night market games and of course, food. People came, people ate, people played, people were simply enjoying themselves. Great atmosphere, great experience. If you’re interested, you can look up “TAP NY”. Other than the night market event , they also hold lots of other events as well. So while I may never be able to visit the country, living in New York City definitely allows me to get as close to the real thing as possible.